No matter the themes we explore in the springtime in preschool, I always make time to invite my preschoolers to plant some sunflowers or similar seeds. Preschoolers have such big hearts, and this becomes quite evident as they give their little seeds the attention and nurture needed to grow into giant, eight-foot tall sunflowers. 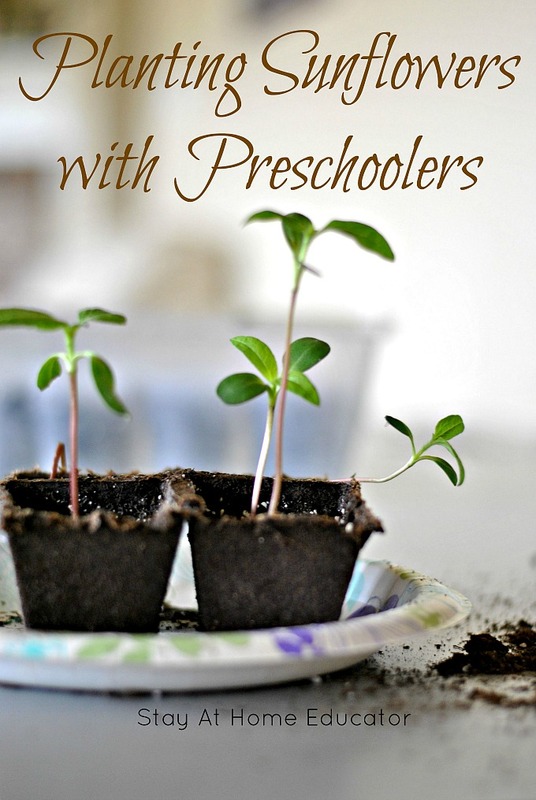 The attention preschoolers put into the care of their little plants is undeniable. We started with seeds, and each day at preschool we gave our plants a little drink of water and watched with anticipation for germination. For the first little sprout to emerge. For the first sign of growth. And the preschoolers were so proud of themselves! Instead offering my preschoolers to dig into a bag of potting soil, risking the potential of said potting spoil being spilled and scattered around my kitchen, I opted to put some soil in a few bowls. This made it much easier for the children to fill their cups. Place the sunflower seeds on a plate or in a shallow bowl. This will also make it easier for the children to pick up their seeds. Have a glass of water and the jumbo Twisty Droppers on hand. I love gardening. You wouldn’t tell by the state of my vegetable garden, though, because my toddlers also love to garden, which means they are constantly in my garden disrupting what hope I have of growing any vegetables. This year, my youngest has dug in my carrots and beets twice (because for some reason my garden is much more interesting than his very large 6×6 foot sandbox), and my older toddler, the neighbor kids, and two preschoolers have stomped through the garden on four separate occasions during an inventive game of sorts. It will be a wonder if even the most child-resilient vegetables emerge this year. I guess they are doing what their bodies and brains know they need. Kids need to get dirty and play! And it isn’t as though they don’t get to help! Just see this post about how to include kids your gardening tasks! But since I am well aware that children are drawn to gardening, I always include it in my preschool lesson plans, no matter the theme. After my annual experiences (yes, this happens every year) with growing my own garden you might think I would shy away from such an activity, but preschoolers are natural born caretakers. So we plant and care for our own seeds in preschool. (Maybe with the hope of keeping them from uprooting all my lettuce). 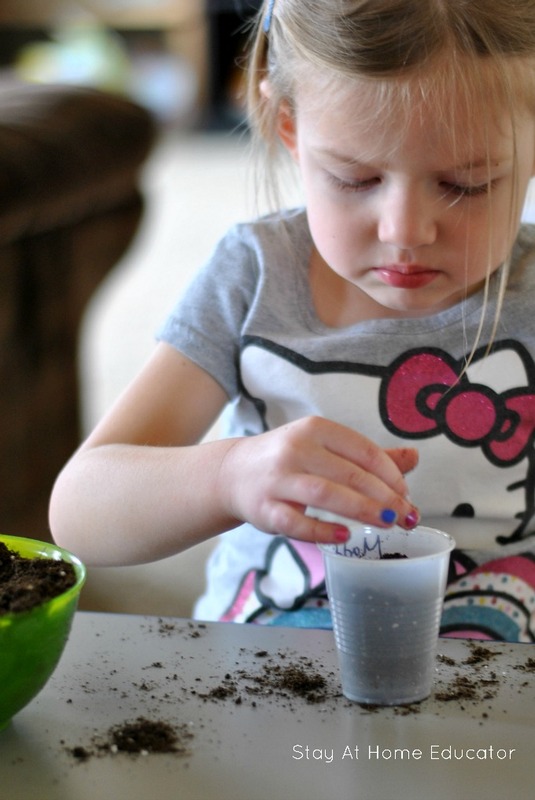 Begin by inviting your preschooler to fill his potting cup about 2/3 of the way full with soil. Add two sunflower seeds. You want to add two in case one doesn’t take. That happens sometimes and the last thing you want is a disappointed preschooler. Once the seedlings emerge, you can pluck out the weaker one, which will allow the better sprout more room to grow. Cover the seeds with another inch or two of soil. Pat down gently. Then invite your preschooler to use a jumbo eye dropper to water the plant. 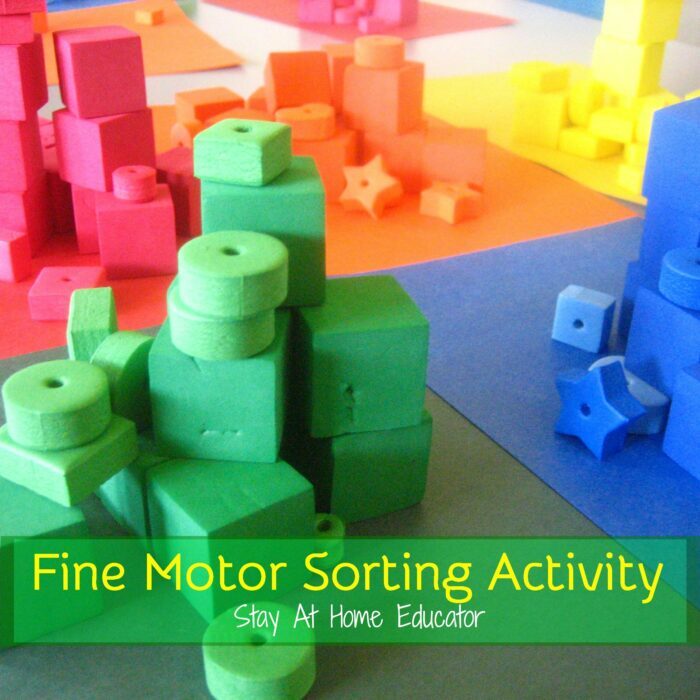 I find using Twisty Droppers is a great way to not only work your preschooler’s fine motor muscles but it also gives them so much more control than simply pouring water out, and it moves the soil less than using a spray bottle. Next, we put our cups in a clear container with a lid, like those from bulk salad or spinach. The reason for this is because it makes a quick and easy greenhouse of sorts, keeping our seeds warm. And, as an added bonus, when placed in direct sunlight for several hours a day, the water cycle will complete itself so you never have to water the seeds! But I always loosen the lid the day before preschool because I want to soil to be dry enough for the preschoolers to add a dropper of water. They take such pride in their jobs. At the same time, we put together a Little Sprout House, like this one by Playdough to Plato. This allowed the preschoolers to watch the germination and sprouting of their seeds, which we reinforced by several books.